We’re obsessed with infused waters, but today we craved something a little different. We had a fresh little watermelon in the fridge, some blueberries and mint that was at it’s very last breath. We grabbed everything and blended it all together, because…why not? 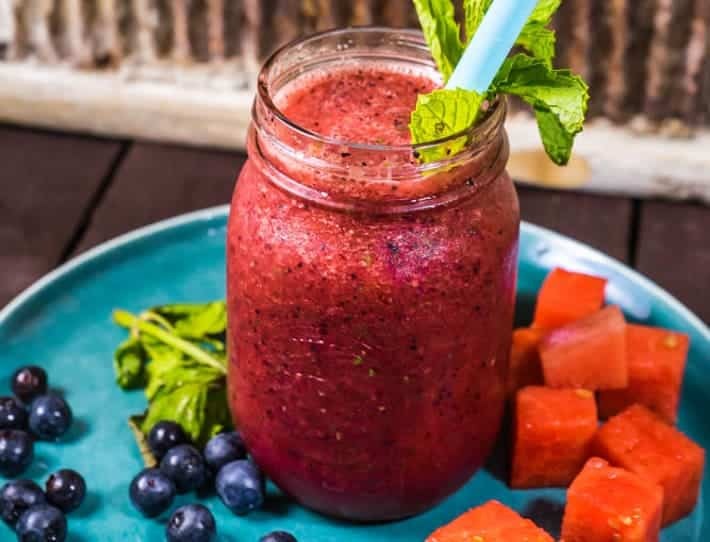 This Blueberry Watermelon Slushy was the result. Watermelon is one of my very favorite things about summertime. It’s cold, crunchy, sweet and most importantly – healthy! Also, it’s one of the prettiest fruits on the planet! When it comes to watermelon, I stuff my face with no shame. A quick blitz and you’re left with a delicious “slushy”. 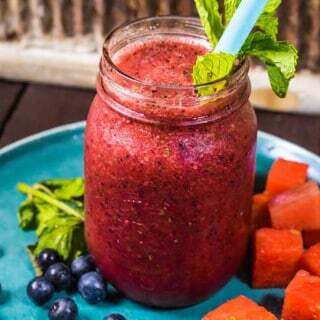 Cold, refreshing and yummy! Perfect for a hot day. We’ve been playing tennis every other day and we’re starting to get pretty good! I’ve lost my skill just as much as I thought I would after 7 years of not playing, but the muscle memory is slowly coming back. We’re even thinking about getting real tennis outfits (haha) to make it more official. Look at the color of this “slushy” and then try to tell me you aren’t excited to give it a go! We have tons of other healthy Drink ideas, including our favorite Lemon, Lime and Mint Water. Blitz until it's all mixed and smooth. Pour in a glass, sit back and enjoy!